Most of the tools do not directly measure properties we are interested in. For example, the radioactivity of the rocks is not important to us, but it does make a reliable clay and organic matter proxy, because these substances tend to have more uranium and other radioactive elements in them. Almost all of the logs are just proxies for the data we really need. We only see the rocks through the filter of the method. Even if we could perfectly derive apparent reservoir properties from the logs, there are lots of reasons why they might be less than accurate. For example, the drilling fluid (usually some sort of brine- or oil-based suspension of mud) tends to invade the rocks, especially the more permeable formations, the very ones we are interested in. The drilling fluid can also interfere with some tools, depending on its composition: barite absorbs gamma-rays, for example. The field is infested with jargon and historical baggage. Since Conrad and Marcel Schlumberger invented the technique almost 100 years ago, thousands of new tools and new methods have been invented. Every tool and log has its own name, method (usually proprietary these days) and idiosyncracies, making for a bewildering, intimidating even, menagerie. Worse still, lots of modern tools collect multi-dimensional data: for example, sonic spectra on multiple axes, magnetic resonance T2 distributions, dynamically-scaled image logs. We drew from several sources to build our cheatsheet. We drew partly from our own experience, but also relied on input from some petrophysical specialists: Neil Watson of Atlantic Petrophysics, Andrea Creemer of Corridor Resources, and Ross Crain of Spectrum 2000. We also consulted the following references, synthesizing liberally where they disagreed (quite often, given the range of vintages of these works). Crain, ER (2011). Crain's Petrophysical Handbook. Despite referring to some of the best sources in the industry, we hereby assert that all errors are attributable to us, not our sources. If you find errors, please let us know. Get in touch on Twitter, use the contact form, or leave a comment. Part of Viking's Provost A4-23 in 36-6, in Alberta, Canada. Geophysical logging is magic. After drilling, a set of high-tech sensors is lowered to the bottom of the hole on a cable, then slowly pulled up collecting data as it goes. A sort of geological endoscope, the tool string can measure manifold characteristics of the rocks the drillbit has penetrated: temperature, density, radioactivity, acoustic properties, electrical properties, fluid content, porosity, to name a few. The result is a set of well logs or wireline logs. The trouble is there are a lot of different logs, each with its own idiosyncracies. The tools have different spatial resolutions, for example, and are used for different geological interpretations. Most exploration and production companies have specialists, called petrophysicists, to interpret logs. But these individuals are sometimes (usually, in my experience) thinly spread, and besides all geologists and geophysicists are sometimes faced with interpreting logs alone. We wanted to make something to help the non-specialist. Like our previous efforts, our new cheatsheet is a small contribution, but we hope that you will want to stick it into the back of your notebook. We have simplified things quite a bit: almost every single entry in this table needs a lengthy footnote. But we're confident we're giving you the 80% solution. Or 70% anyway. Please let us know if and how you use this. We love hearing from our users, especially if you have enhancements or comments about usability. You can use the contact form, or leave a comment here. Don't miss the follow-up to this post, from Wednesday 27 July, in which we explain why we thought we needed to build this cheatsheet. 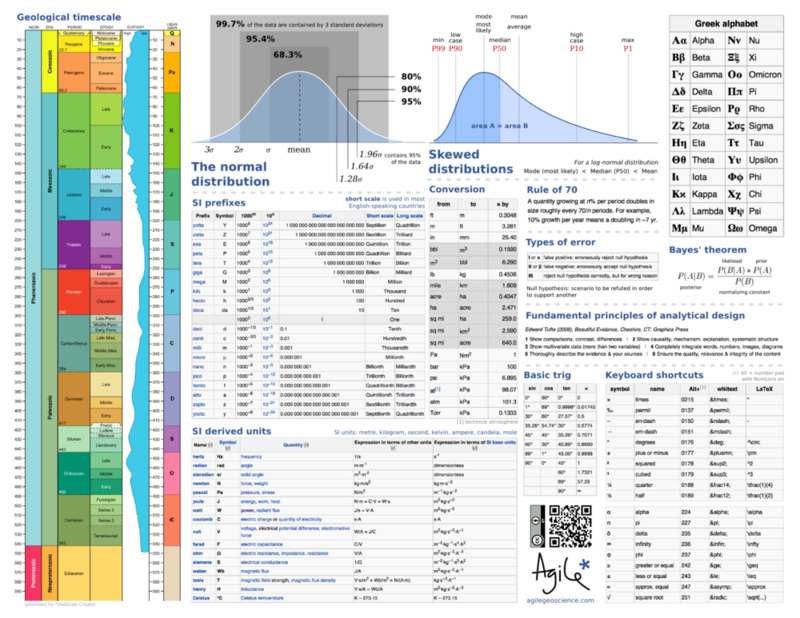 And if you like this, please don't miss our other cheatsheets! Yesterday I posted the rock physics cheatsheet, which is a condensed version of useful seismic reservoir characterization and rock mechanics concepts. It's cheat as in simplify, not cheat as in swindle. As Matt discussed on Friday, heuristics can be shortcuts to hone your intuition. Our minds search to use rules of thumb to visualise the invisible and to solve sticky problems. That's where the cheat sheet comes in. You might not find rock physics that intuitive, but let's take a look at the table to see how it reveals some deeper patterns. The table of elastic parameters is setup based on the fundamental notion that, if you have any two elastic properties previously defined, you can compute all the others. This is a consequence of one of the oldest laws in classical mechanics: Newton's second law, F=ma. In particular one thing I find profound about seismic velocity is that it is wholly determined by a ratio of competing tensional (elastic) forces to inertial (density) forces. To me, it is not immediately obvious that speed, with units of m/s, results from the ratio of pressure to density. This simple little equation has had a profound impact on the utility of seismology to the oil and gas industry. It links extrinsic dynamic properties (VP) to intrinsic rock properties (K, μ, ρ). The goal of course, is not just to investigate elastic properties for the sake of it, but to link elastic properties to reservoir and petrophysical properties. This is traditionally done using a rock physics template. The one I find easiest to understand is the VP/VS vs P-impedance template, an example of which is shown on the cheatsheet. You will see others in use, for instance Bill Goodway has pioneered the λρ vs μρ (LMR) template. In an upcoming post we'll look to deepen the connection between Newtonian mechanics and reservoir characterization. Today, I introduce to you the rock physics cheatsheet. It contains useful information for people working on problems in seismic rock physics, inversion, and the mechanical properties of rocks. Admittedly, there are several equations, but I hope they are laid out in a simple and systematic way. 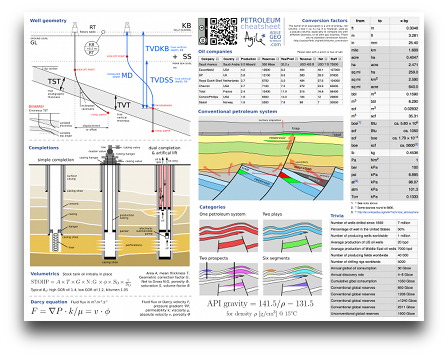 This cheatsheet is the third instalment, following up from the geophysics cheatsheet and basic cheatsheet we posted earlier. To me, rock physics is the crucial link between earth science and engineering applications, and between reservoir properties and seismic signals. Rocks are, in fact, a lot like springs. Their intrinsic elastic parameters are what control the extrinsic seismic attributes that we collect using seismic waves. 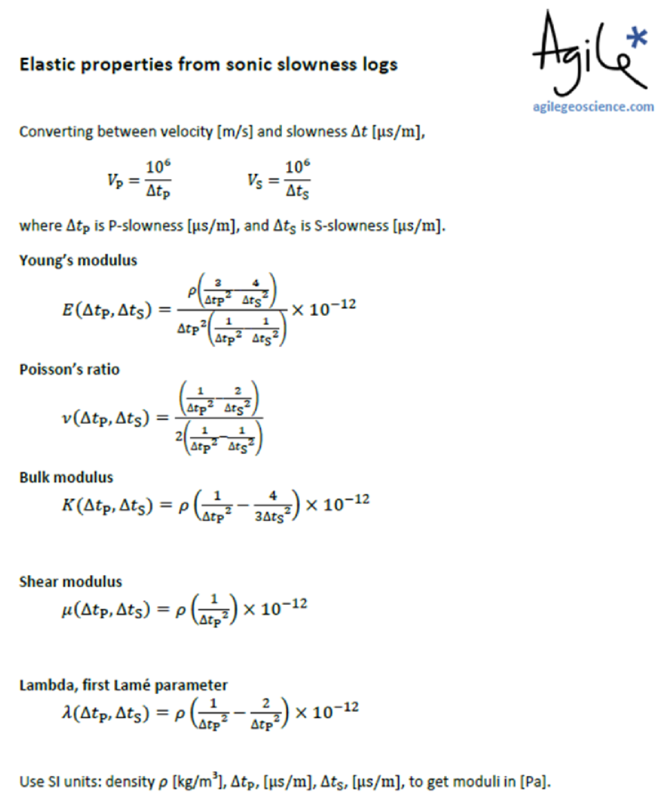 With this cheatsheet in hand you will be able to model fluid depletion in a time-lapse sense, and be able to explain to somebody that Young's modulus and brittleness are not the same thing. So now with 3 cheatsheets at your fingertips, and only two spaces on the inside covers of you notebooks, you've got some rearranging to do! 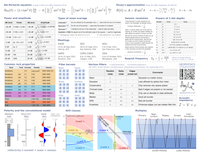 It's impossible to fit the world of seismic rock physics on a single page, so if you feel something is missing or want to discuss anything on this sheet, please leave a comment. Shortly after posting the rock physics cheatsheet, I got a request to quote the equations for the elastic parameters as a function of P-wave slowness, and S-wave slowness; typically acquired from a dipole sonic logging tool. These logs are commonly called "delta-t" (DTP and DTS) and have units of or . Slowness is the inverse of velocity. Cast in this form, the equations are not as compact, and therefore wouldn't fit very easily on the cheatsheet. But you will find these useful if wish to compute elastic properties directly from dipole sonic logs. 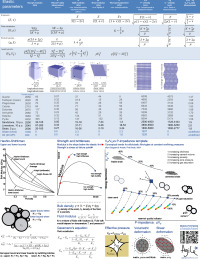 I have posted a new version of the rock physics cheatsheet. 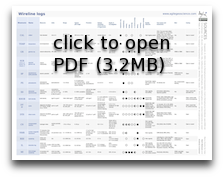 Click on the image of the cheatsheet above to download version 2, or go to the Download page. What's new? I corrected a few typos, and tidied up some of the typography. There was a typo in the first Hashin–Shtrikman equation, and there was a typo in the formula for VP as a function of Young's modulus and Poisson's ratio (first row of the elastic properties table). Finally, we made some minor improvements to the layout. A couple of weeks ago I posted the first cheatsheet, with some basic science tables and reminders. The idea is that you print it out, stick it in the back of your notebook, and look like a genius and/or smart alec next time you're in a meeting and someone asks, "How long was the Palaeogene?" (21 Ma) or "Is the P50 the same as the Most Likely? I can never remember," (no, it's not). Today I present the next instalment: a geophysics cheatsheet. It contains mostly basic stuff, and is aimed at the interpreter rather than the weathered processor or number-crunching seismic analyst. I have included Shuey's linear approximation of the Zoeppritz equations; it forms the basis for many simple amplitude versus offset (AVO) analyses. But there's also the Aki–Richards equation, which is often used in more advanced pre-stack AVO analysis. There are some reminders of typical rock properties, modes of seismic multiples, and seismic polarity. As before, if there's anything you think I've messed up, or wrongly omitted, please leave a comment. We will be doing more of these, on topics like rock physics, core description, and log analysis. Further suggestions are welcome! 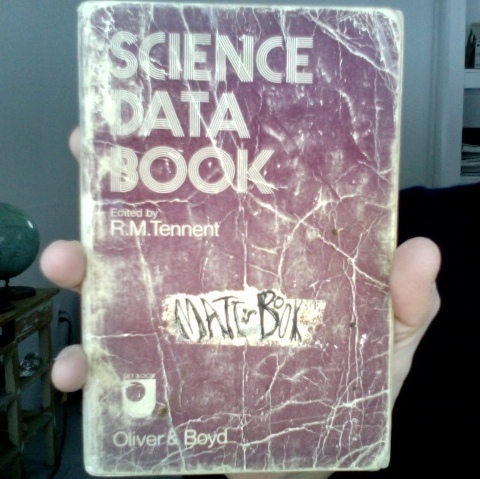 When I was a spotty schoolboy my favourite book was the Science Data Book. This amazing little book, which fit in my jacket pocket (we wore suits to school), went everywhere with me. Everywhere at school, I mean, I'm not that much of a nerd. It contains some really handy stuff: the Greek alphabet, SI unit definitions, the periodic table, the fundamental constants, handy formulae like the Maclaurin series, (remember that? ), and even a very nice table of isotopes (did you know that the half-life of vanadium-50 is 400 trillion years?). Amazingly, there are some used copies of that little book on Amazon. You might think that in these days of smartphones and WiFi everywhere there's no need for such things. But have you never sat in a meeting or lecture and just couldn't remember how many acres in a hectare (2.47), or when the Silurian was (417 Ma BP)? Usually it's too much hassle to pull out my phone, then find Wikipedia and the one piece of data I need. Especially when tapping away on a cell phone looks like you're texting someone 'So bored, please get me out of this meeting, call me in 5 mins?'. So, I give you the first in a series of cheatsheets. This one has mostly basic stuff on it; future editions will have more geoscience-related content. Print it out and stick in your notebook, or maybe on your wall, right next to Signs & Symbols. If you use it, please let me know what you like or dislike, so I can improve it. Have I missed anything you're always looking up?